The year 2015 presented significant challenges for our Stray Leaves website and our blog Leaves of Gas. Despite those challenges, the statistics show that more visits generated more hits, more page views, and more file downloads than in previous years. Now we look into our crystal ball for 2016. Right now, our 2016 crystal ball shows us a future for Stray Leaves that is both clouded and bright. If difficulties can be overcome by more investment and website improvement, the probability exists that Stray Leaves and Leaves of Gas will progress to become a better research resource and a more influential source of information as it approaches its 20th anniversary in 2018. The year 2015 began with a recovery from a hack to Leaves of Gas that occurred in November of 2014. Recovery of the blog took three months. The devastation from the hack proved a blessing in disguise. As Google downgraded Leaves of Gas in public searches as a hacked website, Google also quickly identified the posts and pages that were affected by the hack. Google’s identification made it easy to recapture the blog posts from our backup archive. With the removal by Google of the designation of hacked website, all might have seemed restored to normal. However, Google presented another challenge for Leaves of Gas. In an effort to present quality content at the top of Google searches, Google changed its algorithms. Anticipating that mobile applications are poised to overtake desktop applications, as more and more people access the web via tablet or smartphone, Google announced that it would give priority in search strings to websites that are mobile responsive and which produce content of high quality. To keep the priority status Stray Leaves earned over so many years, Stray Leaves and Leaves of Gas had to adapt to the new requirement from Google to become mobile friendly. 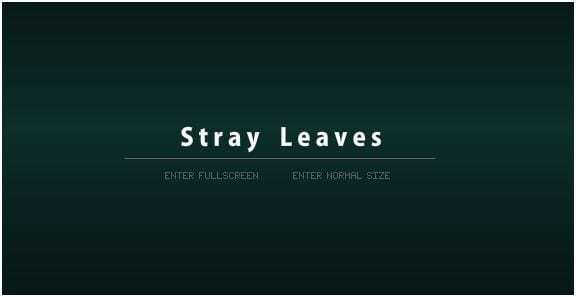 Old landing page for Stray Leaves. Now a WELCOME page. Our WELCOME page that was created five years ago no longer was viable to Google as a landing page. Steve Jobs intended to kill flash websites, by rendering them no longer accessible on smartphone or on tablets. Our WELCOME section was constructed on a flash platform. Now our WELCOME page sits in semi-retirement as a link on the menu for Leaves of Gas. Those who still access the web via laptop or desktop can still access the old WELCOME page. At the front door of our website now is our new landing page which is Google compliant. Our changeover from flash to mobile friendly landing page cost us valuable web traffic. For almost three months, visits to Stray Leaves fell by almost half over 2014 statistics. To return to par required more improvements. Our SURNAMES genealogy research database has always been a premiere attraction of our website. 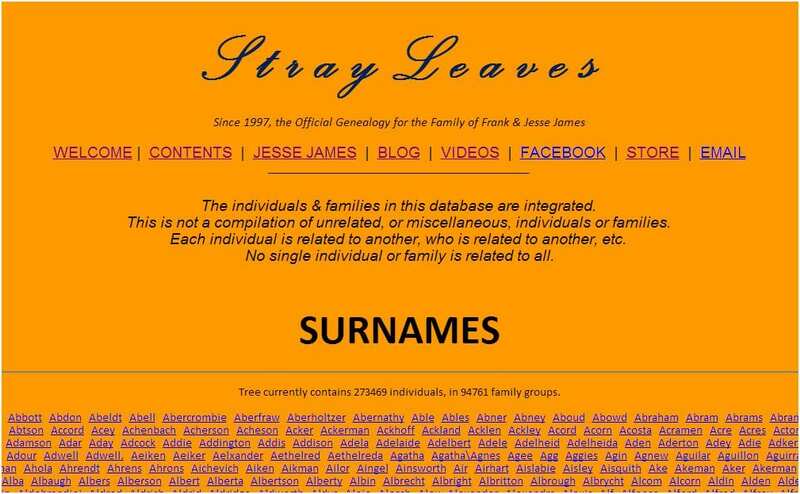 Since its inception in 1997, the 55,000+ web pages that make up the database have been a magnet for genealogists and for researchers looking into much more than the genealogy of the James family alone. But our database was built on a 1997 software platform. That software is no longer supported by its creator. The old platform inadequately serves Google’s standard of today for a mobile-friendly presentation. Not yet finding a suitable substitute, the existing software was re-coded to improve screen visibility for mobile devices. Still lingering is the need to find another new platform for the database altogether. That is a project for 2016. By summer and into the fall of 2015, our website and blog began to recapture lost audience and its priority standing in Google searches. At the beginning of October, however, the arrival of the detestable Bob Ford/Jesse James Photo Hoax shot our statistics into the stratosphere. We were poised for a ceiling breakthrough. But a follow-up story on the hoax cabal brought everything to a crash. Leaves of Gas was hacked again. This hack appeared to emanate from Houston, Texas, the home of the hoaxers. This time, repair to Leaves of Gas took about thirty days. Using a security backup file of the entire blog installed after the previous hack, the entire blog was restored. Then, security was doubled. Within ten days, stats were restored to pre-hack level. Since then, stats have continued on an upward trajectory. Our crystal ball for 2016 tells us, the oldest section of Stray Leaves still is in need of a very challenging makeover. The CONTENTS and JESSE JAMES pages, together with their ARCHIVED CONTENT and NEW FOUND LINES subpages, must still be transcribed, remounted, and presented again in a new mobile friendly theme. Another year may be required to achieve this. 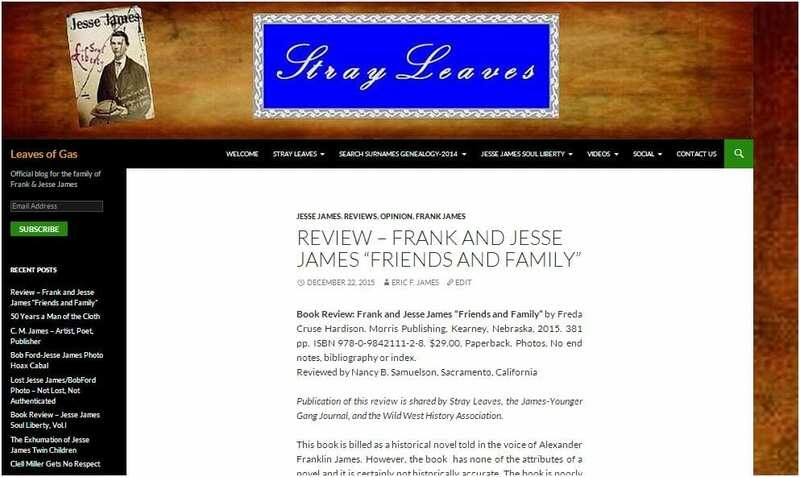 Further complicating needed improvement to the Stray Leaves and Leaves of Gas website and blog is the additional need to revamp the website for Jesse James Soul Liberty. 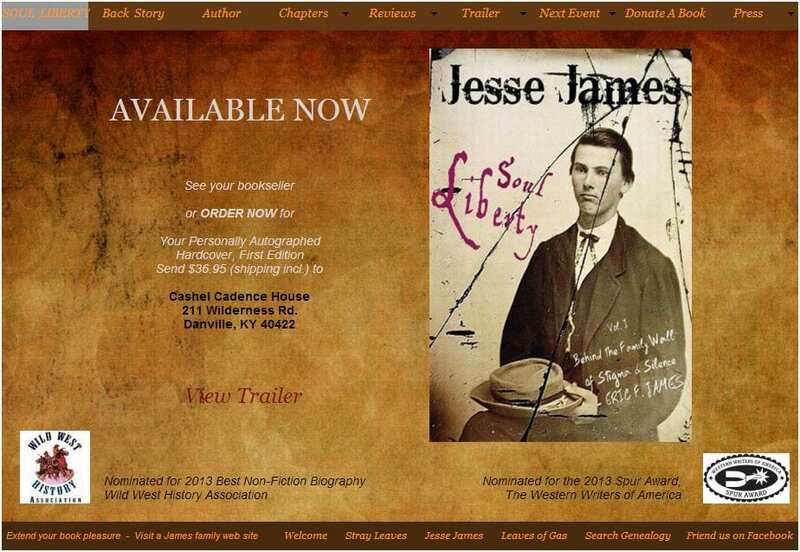 Funding that could easily have continued to support our website and blog has been directed to research, promotion, and publications for producing our epic five-volume history of the Jesse James family. Our present book website is not recognized by Google as being mobile-friendly. This, too, needs to change. Our entire book website needs to be republished for both ease of use and ease of customer purchase of our family history books and related souvenirs to come. Left waiting on the horizon remains our plans for the Joan Beamis Studio for film, video, and podcast production, and for continuing Jesse James Family and Gang reunions, highlighting and celebrating the unique contributions to society by slected members of the James family. Meanwhile, the cost of making the required improvements, plus the need for added security, up-to-date software, editorial applications, design, storage and other services, arise from the former hobby level of Stray Leaves to a new level of professionalism. Time has come to recognize that Stray Leaves and Leaves of Gas must have financial underwriting to support this new professional level of service and to continue as an effective research resource. Can your crystal ball see the future of Stray Leaves and Leaves of Gas?Our options for badly needed support and underwriting are limited. Should our website and blog accept advertisements? Should patronage or corporate sponsorship be sought? Should the SURNAMES database be put on a paid subscription basis? Should Leaves of Gas become a paid membership site? Or, should our website and blog continue to sustain free use solely through the support of user and visitor donations? SEND ME AN EMAIL. Let me know your thoughts.